As few weeks left for the Valentine’s Day, Swiss luxury watch brand Blancpain suggests a token of love from their exclusive watch collection. This is a beautiful watch specially created for the day of love and lovers. This model with its shapes, colours and gemstones inspired by the universal symbols of love is bound to appeal to romantics keen to declare tender feelings for their sweetheart. Featuring a flurry of hearts, together with a subtle play on textures and shapes, the dial Blancpain has dreamt up for this occasion comes to life at the expert hands of the company watchmakers and artisans. The white mother-of-pearl base is enhanced by diamond hourmarkers. Five red-lacquered mother-of-pearl marquetry heart, distinguished by their strikingly generous volume, lend a vivid touch of colour and brilliance. The 34 mm steel case is topped by a bezel set with two rows of full-cut diamonds, while the case middle is adorned at 9 o’clock with five liquid ceramic hearts. This technique calls for meticulous application of the liquid matter prior to a firing process that solidifies it. This three-hand model, on which the dainty seconds hand counterweight takes the shape of the Blancpain logo, is equipped with mechanical self-winding Calibre 1150. Also displaying the date and endowed with a 100-hour power reserve, this timepiece offers a successful daily association of useful functions and elegance – right the way through to the rotor which is also decorated with hearts. A seamless white ostrich leather strap featuring an alzavel lining conceals more dainty hearts, setting the perfect finishing touch to this watch flying the colours of love. 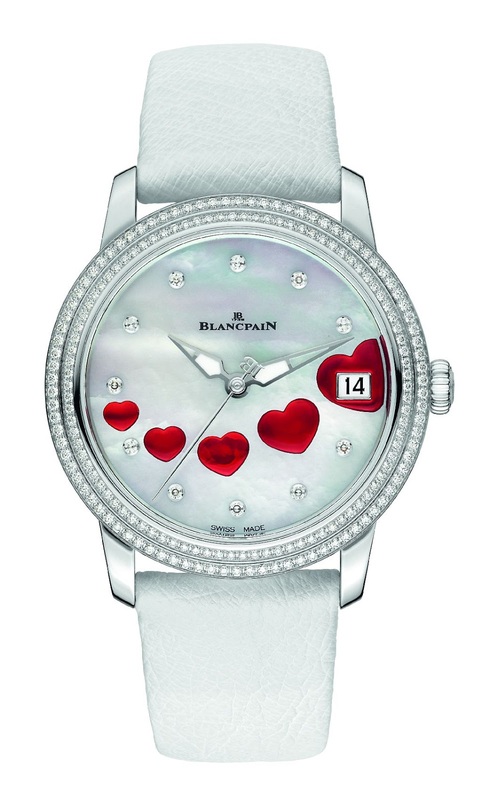 The Saint-Valentin 2013 model is issued in a 99-piece limited edition, delivered in a white wooden presentation box encrusted with white hearts evoking the dial design.